Have you tried the New User Welcome Kit? Watch short, focused demo videos and steadily get better at using JMP. We launched the New User Welcome Kit about six weeks ago, and we've already gotten great response from JMP users. Hundreds have tried it already. It's an interactive web resource that helps you get comfortable with the basics of JMP – at your own pace. You follow a learning road map that lets you immediately begin applying skills you learn. You'll further build your confidence and have an opportunity to connect with other JMP users around the world. 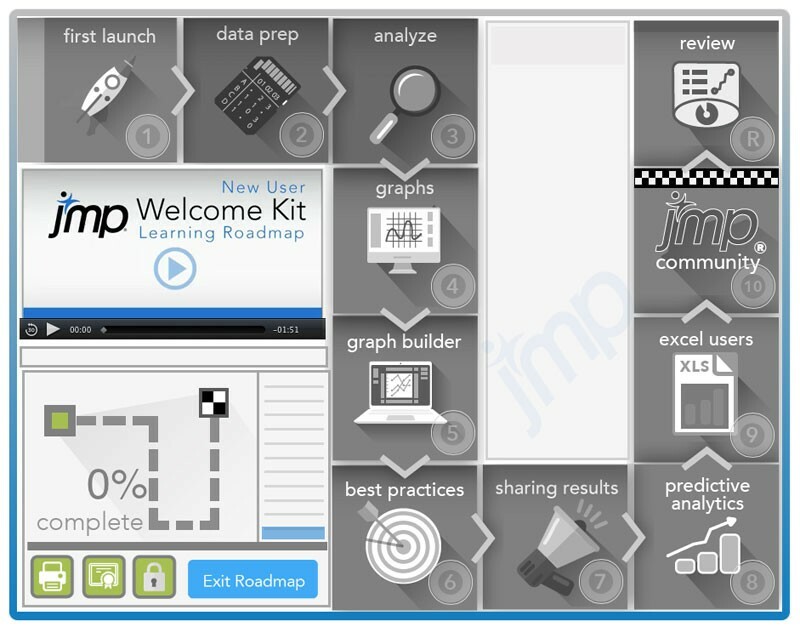 Videos and activities take you through 10 basic areas of JMP. As you make progress in the road map, you'll find that you are steadily getting better at using JMP. And if you finish the learning road map in 20 days or less, you're eligible to get a printable certificate. At the end of April, we announced and congratulated the first person worldwide to let us know he finished the road map and request his certificate: Dr. Chuckaphun Aramphongphun of Kasetsart University in Bangkok, Thailand. Have you tried the welcome kit yet? If not, we hope you will. And if you have already finished the learning road map, how long did it take you? Let me know in comments, please. Print and show off your certificate taped to your office door or cube to encourage your fellow JMP users to join in. And don't forget to grab your JMP User Community badge via the link you'll get at the end of the module.